63 yo white male presents for a routine exam. Gonio picture is attached. IOP is 13//15. 1. What is pictured on gonio exam? 2. What is the black dot in the picture? 3. What are the chances that this patient will develop glaucoma? 4. Guess what his profession is based on the gonio picture. Hmm. Difficult to tell from picture. I would have to agree that it could be hemosiderin. However, would have to monitor for something more malignant. If any growth more concern for neoplasm. If isolated and no growth likely hemosiderin and could be Mike Tyson. This is Dr A. Yes, this is angle recession. Note the wide space between the root of the iris and scleral spur. The black speck is hemosiderin deposit which indicates that this patient had a h/o bleeding into this angle. 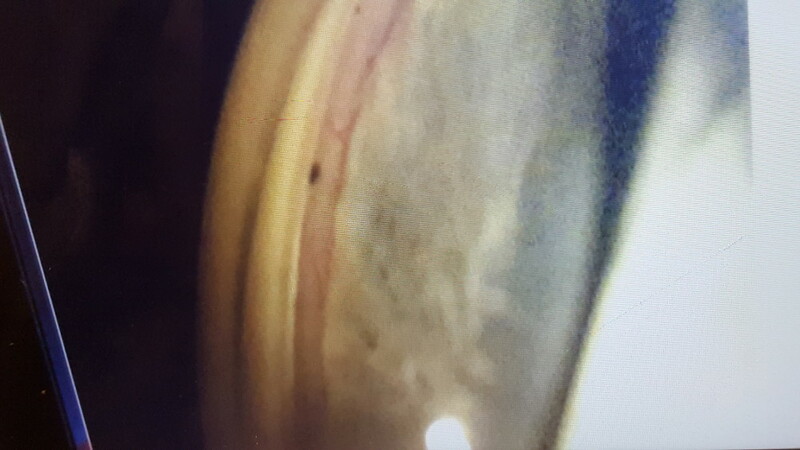 Note two blood vessels cutting across the angle to scleral spur. These are normal and should not be considered as new vessels as seen in PDR. Those new vessels are finer and cross the scleral spur. There is a 10% chance of glaucoma in 10% of the patients when more than 180 degrees of the angle is involved. These patients need to be followed every 6 months. 1. Angle recession2. Hemosiderin deposit3. 5-20%4. Boxer?